Most of my life is spent inside a command line. Until last month, you would see me with multiple command lines or multiple tabs. It used to be very confusing and I couldn’t see important ones without multi-monitor setup. When I shifted 20+ inch monitors both at home and work. I wanted to use something that made use of available real estate. That’s when I read about terminator. Terminator provides a way to arrange terminals in grids on the same screen. 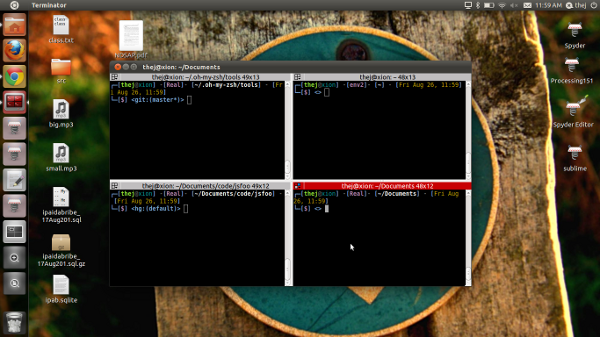 So with in the same window I can arrange a lot of terminals the way I want. The picture above should talk by itself. Now my terminal works like a command-line dashboard. Recently I started using it on small screens too. If not anything, at the least I can make use of right side of my screen. Very recently i shifted from BASH to ZSH.I run Ubuntu on all my personal computing devices.BASH is the default shell on Ubuntu. I had done certain customization to suit my daily requirement. But once I got to know about the Oh-my-zsh, there was no way I could stick to BASH. oh-my-zsh is zsh on steroids. Its a set of configuration files that attach rockets to your command line. I have modified a bit to suit my use cases but most of the cases are covered by the original project or community submitted plugins. This was something that I was missing for years. Now no more going back to BASH. 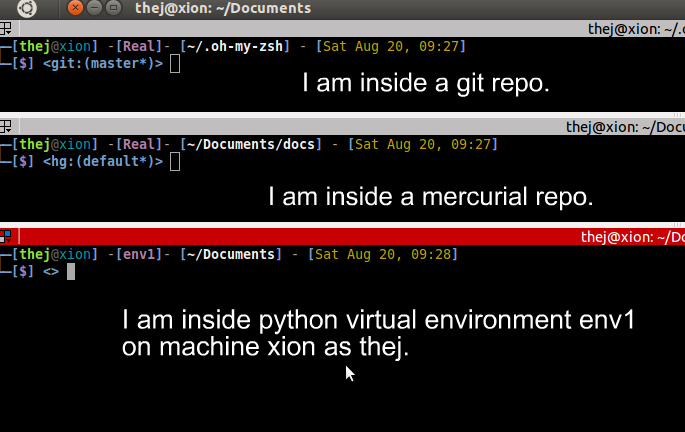 In the above picture it shows how my ZSH shows where I am, which machine, which env (virtual/real) and if the current folder is a git/hg repository. How does that look?